Alright listen up, the hardest part of this whole thing is separating your cake mix into 5 parts. We’ll get there. Preheat your oven to package instruction. Place paper cupcake liners into 2 muffin tins, set aside. First up, in a stand mixer, make your cake mix according to package instructions. Next, divide that batter into 5 bowls evenly. Chose your rainbow gel colors of choice (I did red, yellow, green, blue and purple). Mix batters until combined and colors have reached the brightness of your choice. Make sure you have a separate spoon in each bowl. Now comes the “work”. Start with small spoonfuls to be sure you have enough batter for all 24 cupcakes. A spoonful of red into each lined cupcake is first. You should have JUST enough to get some into each cup. Then you will do that step over and over for each color order in your rainbow. All you do is plop a spoonful of the next color on top of the previous one. Sounds too easy right??? That’s because it is. Tedious, yes, but actually really easy. 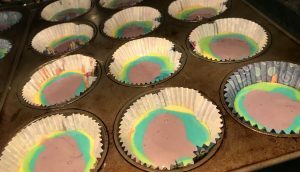 When cupcakes are filled with all colors, bake in the oven according to package instructions. Once done, place on a metal rack to cool. When cooled completely, top each cupcake with vanilla icing, but not too much. The icing is going to act as your glue, for the “crunch” in the title. 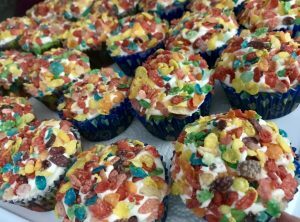 On a plate dump out 1-2 cups of your cereal, then one at a time put the cupcakes icing side down into the cereal. You may want to apply a little pressure to make sure everything sticks. There you have it. 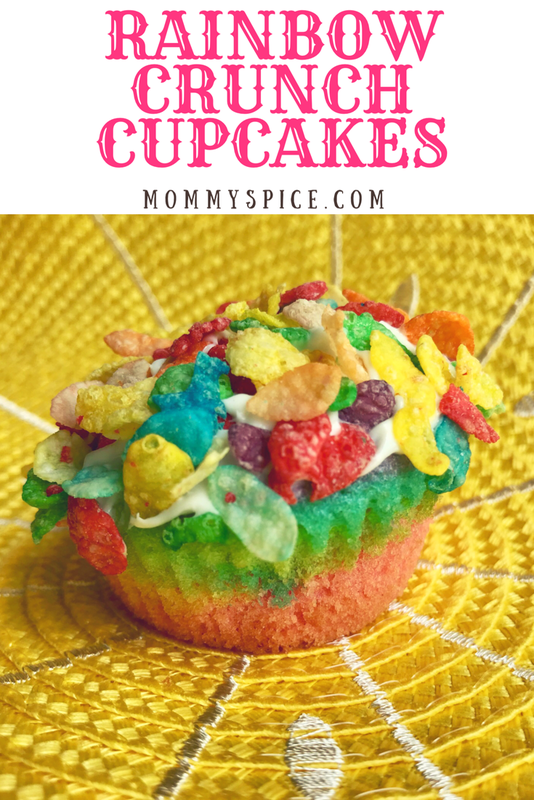 Show stopping rainbow cupcakes sure to make any kid happy. I was so hesitant to just drop batter colors on top of one another. I was worried they would come out brown and my little girl would be so disappointed. They came out so bright and all the colors stayed separated I was blown away! My tip for this one comes from one of my ‘trial and error’ runs as I like to call them, chose your rainbow colors carefully. I was using red and orange in my rainbow and even though they didn’t bleed together, they did however end up just both looking pretty much the same color once baked. Next time I skipped the orange all together for a little more contrast and was much happier with my end result. I am all about texture in my cooking and it’s so funny to see how it’s rubbed off on my children. First batch of these was just regular sprinkles and I could see my little foodie wanted more. 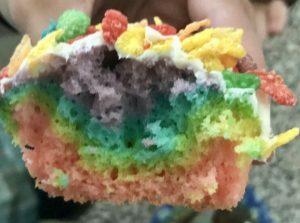 You don’t know an entire rainbow awaits inside the cupcake at first glance. 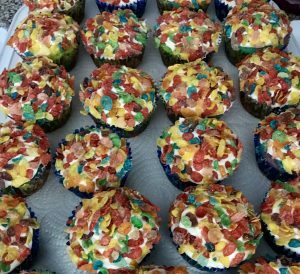 To the pantry I went and once I saw that rainbow cereal I knew it was the perfect thing to elevate these cupcakes, and boy was I right! The cereal gives them massive curb appeal, intrigue and of course texture! Be sure to give these a try for your next get together, no one has to know it’s a box mix!